The iconic classic motorcycle manufacturer Jawa is all set for fresh innings with its new range of motorcycles. Two years ago Classic Legends Private Limited (CLPL), a subsidiary of Mahindra and Mahindra, had acquired BSA Company for around Rs 28 crore. Mahindra and Mahindra owns a 60 per cent stake in CLPL. This acquisition would allow Mahindra to acquire or obtain licence of the brand and use the same for selling, marketing and distribution of motorcycles. Anand Mahindra recently tweeted about the resurrection of the Jawa Motorcycles brand. And that has got many motorcycle enthusiasts in India and also around the word excited. While there is still some time before we get to see new-age Jawa motorcycles commanding presence on Indian and global streets, here is a video of a Jawa 250 Type 353 that was manufactured by Jawa Motorcycles in Czechoslovakia between 1954 and 1962, getting resurrected into a masterpiece by Slovakian based restoration brand Motoren. The Jawa 250 Type 353 made use of a 248.5cc engine that produced 12PS of power and was mated to a 4-speed gearbox and also came equipped with an automatic de-clutching mechanism. In those times, Jawa claimed a top speed of 105kmph. The distinct exhaust note that made Jawa motorcycles popular was designed to replicate the look of fish tails. The 10-litre fuel tank was finished in aluminium and also featured a switch box along with an ammeter. The seat drew inspiration from a guitar. The gear and kick starter lever were placed on the same shaft but had an independent functioning. Interestingly, the Jawa 250 Type 353 was equipped with adjustable steering dampers made using cork and rubber. 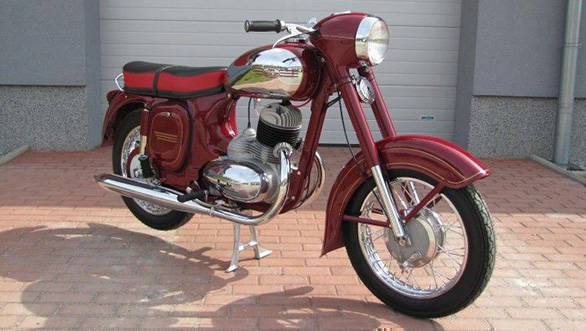 The Jawa 250 rode on 3.00x16 front and 3.25x16 rear tyres.